With a movie that's third in a franchise, seeing the previous films would seem like a prerequisite. 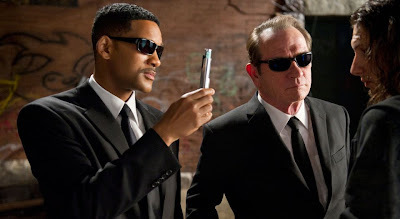 I have seen MiB and MiBII many times, but my movie partner hadn't seen any of them, and he thoroughly enjoyed it. A few of the easy jokes he might not have understood I was able to whisper to him. 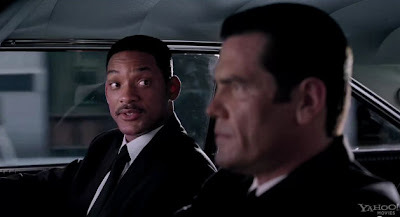 But overall, if you've EVER seen Will Smith or Tommy Lee Jones, and you have an open mind, you pretty much have everything you need to enjoy this third incarnation in the franchise. First, the movie both does and doesn't suffer from sequelitis - which usually means more characters (or replaced characters), more explosions, longer running time, and a more complicated story. All of those things have happened (the movie is 5 minutes longer than the original at 102 minutes, and 15 minutes longer than the second), there are more complicated explosions and devices. 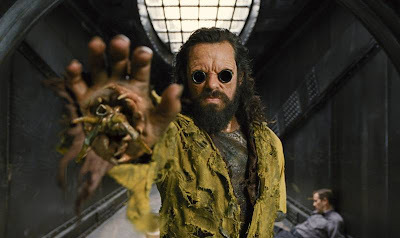 However, there is really only 1 major new character - the villian, Boris the Animal (played with great insanity by Jemaine Clement). There are 2 replaced characters - Rip Torn's Zed is replaced by Emma Thompson's Agent O and obviously Josh Brolin plays a young Tommy Lee Jones, so not really replaced. Otherwise, this actually feel just like another installment in an ongoing series. They acknowledge the time lapse since the original, but there's no real 10 minute introductory synopsis that tells us what happened in the first two. And thankfully, they haven't tried to keep ALL of the characters from the previous versions. 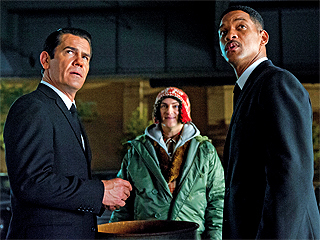 We met so many different aliens and saw so many gimmicks (All of which were employed in MiB II) that to continue that would have been insane. There were images of Frank, the talking pug, but he didn't appear. So those who had seen the first two were in on the joke that he appears as a side show at Coney Island, but newbies just saw a funny poster. The subtle reminders of the previous movies were fun, particularly BECAUSE they were subtle. As for the new items - particularly the story. Essentially, Boris the Animal was put in prison 40 years ago by Agent K (Tommy Lee Jones). Boris is of an alien race that used to destroy entire planets, but is now the last of his kind. He intends to go back in time and kill Agent K to ensure that his race survives to destroy the Earth. When Agent J (Will Smith) figures this out, he follows him back to July 15, 1969 (the day before the launch of the Apollo space mission that landed on the moon). 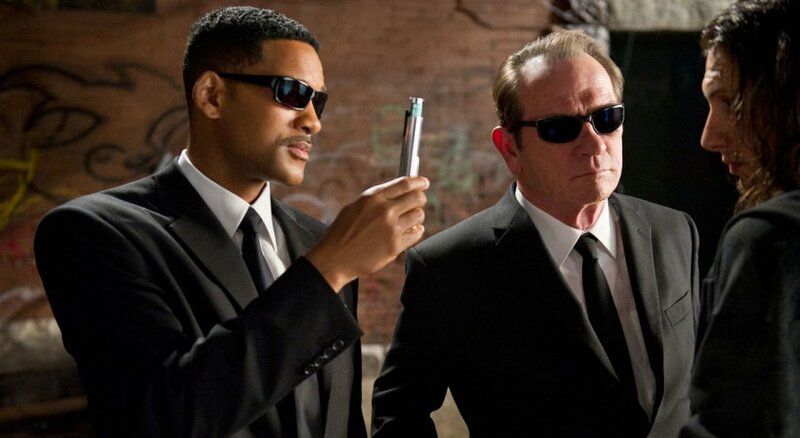 The fact that they happened to tag this to a historical event added a lot to the movie - they didn't need to explain much, but everyone had a context. Also, with "Mad Men" and other recent '60s era movies and shows, we're familiar with much of the visual. They did take the opportunity to humorous poke fun at how far we've come in some social aspects vs others. Agent J yells at cops for assuming that a black man driving a nice car means he stole it (which J did!). And the elephant in the room - Josh Brolin's spot-on imitation of Tommy Lee Jones, specifically as Agent K. He did it - grimace, voice and all. They are able to explain why Brolin is obviously not 40 years younger than Jones, and why he sometimes smiles. But all of it is really well meshed with the story line. There are very few lines that are put in only to explain inconsistencies, but rather are creative decisions that make a lot of sense. I won't give away the end, but I can see some people disliking how they resolve some of the end as being too perfect and manipulative, but I really liked it. And, it clears up a line from the first film that was never explained. Overall, I highly recommend this as excellent entertainment - whether or not you've ever see the previous 2. If I were to rank the three films - #1 is slightly better (more original) than #3, and then a fairly large jump to #2, which suffered horribly from bad story and Lara Flynn Boyle and Johnny Knoxville. I don't think I liked this one as much as you did. Definitely better than the second one, but not near the original, which may not even be that good and I'm merely relying on a decade (or longer) memory. I really hated Boris and think he was tbe main downfall. The last two films just haven't had good enough villains for me. At least I didn't fall asleep in the theater, like my husband.